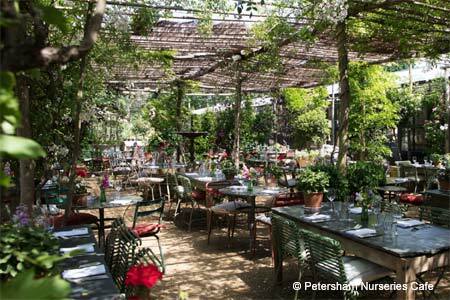 Culinary director Lucy Boyd brings Italian flavors and exceptional knowledge of produce to this delightful garden café. : Culinary director Lucy Boyd leads an expert kitchen team at this casual, bucolic eatery. Special attention is paid to the taste and quality of the produce, which inspires an intimate lunch menu prepared six days a week. From edible flowers to herbs and vegetables, the fresh ingredients are sourced from the on-site Petersham House Walled Kitchen Garden. Delight in elegant starters like the char-grilled squid prepared with coriander, ginger, chili, garlic, lime and burghul, or the salt marsh rack of lamb as an entrée. To complete the dining experience, the café offers a signature watermelon Bellini in addition to a number of sweet wines. Pistachio ice cream, lemon verbena sorbet and a white peach tart are just a few favorites for dessert.